Particle motion and capture in continuous steel casters were simulated using a Lagrangian trajectory-tracking approach, based on time-dependent flow fields obtained from large-eddy simulations (Part I of this article). A computation was first conducted on a water model of a full-scale standard slab caster, where measurements were available. It simulated the transport of 15,000 plastic particles and their removal by a screen positioned near the mold top surface. The computation shows the screenremoval fractions to be 27±5 pct for 0 to 10 seconds and 26±2 pct for 10 to 100 seconds, which agrees with previous measurements. The flow exiting the nozzle was relatively uniform, and turbulent motion in the domain was very chaotic, so particle removal did not depend on the initial location of particles introduced in the nozzle port. A computation of motion and capture of 40,000 small inclusions (10 and 40 µm) was then performed in an actual thin-slab steel caster. The particles moved through the mold region with an asymmetrical distribution, which was caused by transients in fluid turbulence in the lower recirculation region, rather than by inlet variations at the nozzle port. Only about 8 pct of these small particles were removed to the top surface. This removal fraction was independent of both particle size and density, likely because all the simulated particles were too small to deviate significantly from the surrounding fluid flow. Finally, the computational results were further processed to predict the ultimate distribution of impurity particles in the solid thin slab after a short burst of inclusions entered the mold. They were reprocessed to reveal the distribution of total oxygen content for a steady inclusion supply from the nozzle. 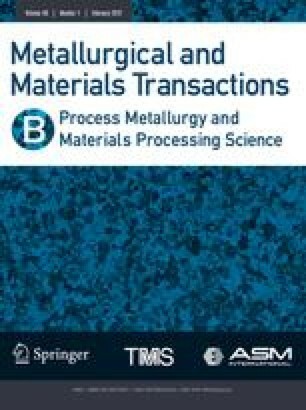 The results of this work confirm the important role of flow transients in the transport and capture of particles during continuous casting and can serve as a benchmark for future simplified models.